Hello everyone. 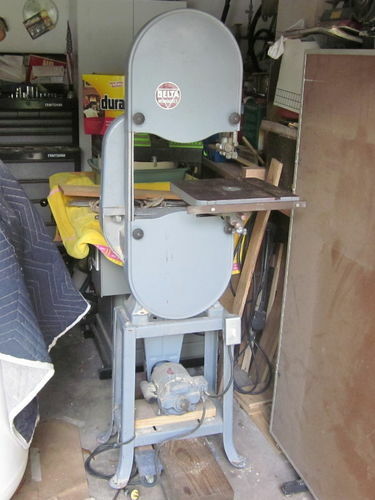 I am looking at possibly picking up a Rockwell Model 14 band saw this evening. It looks super clean. Has Nice paint, Original Rockwell 1/2hp motor, Original Fence, Original work light. It also has a mobile base. He says it is in great shape with no virtually no rust and was well taken care of. He says all tires/parts are good and I can fire it up and cut some wood. The seller will take $500. No less. I’ve been watching for months and when they do come up they are always around this price but rarely this clean and almost never complete with everything. I am new to bandsaws. Never owned one but have been talking with folks who highly recommend this saw. What do you think? Please let me know what I should look for before I buy it? I have almost zero knowledge with this. Price is a little rich for me. I’d rather find a dirty one and restore it. For that price I’d just buy a grizzly. It’s a good quality saw. The price is decent and you won’t have to rehab anything if the owner’s being up-front with you. I suspect he is, if for no other reason than he offered to allow you to test-drive it. If everything works properly, I’d take it home tonight. Personally, I’d rather use it right away than have to re-build it to save a few bucks, but that’s me. No criticism of others. To each his own. @kkaucher thanks. what would you advise me to pay attention to while I’m checking out the saw? I’m not familiar with the parts of a band saw. I hear things about bearings, guides, tires, etc. I can watch a few YouTube videos to familiarize myself before I go. If I have to replace bearings, guides, etc. are these parts expensive? I m not familiar with the parts of a band saw. I hear things about bearings, guides, tires, etc.[...] If I have to replace bearings, guides, etc. are these parts expensive? If it’s plug-n-play as the seller states, then you shouldn’t need to worry about tires, belts, etc… I usually will replace the bearings regardless just so I know they are good (~$20). Thrust bearings (part of the guides) are considered consumables, but are cheap (standard 6200-ZZ bearings). Other than that, just make sure nothing is broken/cracked. It’s the missing and broken stuff that can really bite you in the wallet. As for price, that is for you to decide – although I would consider it on the high side. I agree with Fridge, at that price I’d rather have something newer. Does it have the riser block or is it just the standard 6” resaw capacity? @Steve, it’s a standard saw. No riser. @HokieKen thanks. 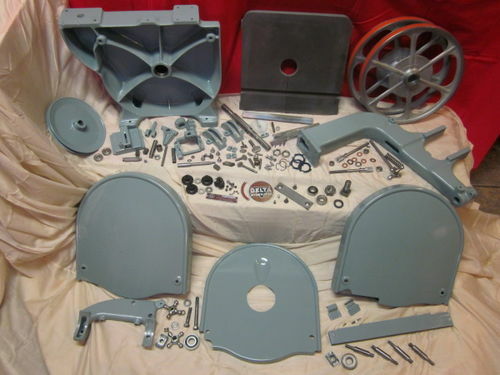 I wish it was a $250 – $300 saw around here! The ones I see at that price are really bad shape usually. Thanks for your responses guys. I have decided not to get it. I really want the ability to resaw a bit higher than that. My gut says to pass on this one. Thanks Kenny. It really looks nice but when the gut says no, I gotta listen. May be a better deal just around the corner. And I like good deals! Lol. Keep in mind that it doesn’t have to look pretty to be 100% functional, and cosmetic issues can lower the price significantly. For example, the last Delta BS I bought was fully functional, but it certainly wouldn’t win any beauty contests. However, it also cost me less than 20% of the asking price of the one you were looking at. Hey Brad, I’m with ya. I usually go for the deals. Looks like you got a steal. I’ll be patient and wait for that!